In the 1960s U.S., a tattoo was usually a sign of anti-social or illegal activity. Few people had them. Today, at least one in five Americans has a tattoo, including sports stars, actors and young professionals. But some people say tattoos still have no place at work. Many well-known companies have “no visible tattoo” policies. However, some industries are not so strict when it comes to tattoos. And some are changing to reflect a more “tat-friendly” culture. During any workday commute in Washington, D.C., you will see people dressed in different kinds of business clothes -- suits, brown khaki pants and collared shirts, modest dresses and skirts. D.C. has a large government workforce along with many politicians and lawyers. As a result, most people dress in a conservative way. On a crowded subway train one morning, a young woman stands out. She is wearing shorts and a tank top. However, it is not her clothes that make her look different from her fellow commuters. It’s her arm. She has a large, brightly colored tattoo of a beautiful woman with long dark hair, wearing a red scarf and jewels. The tattoo covers the top of her left arm. Erin DeRosa, Hair Stylist in Washington, D.C. Her name is Erin DeRosa. She is a 26-year-old hair stylist. 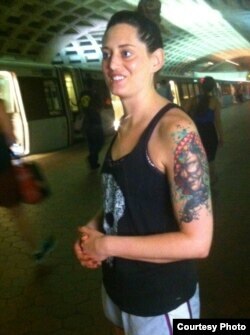 Ms. DeRosa says her college friends warned her to not get such large tattoos. They told her the tattoos -- or “tats” for short -- would make it hard for her to get a job. Not so, says Ms. DeRosa. She says the hair industry puts importance on creativity and individuality. So, showing her tattoos actually helps her career. She says that her clients do not get “freaked out” or are not upset by her tattoos. She says that her salon is a modern one, suggesting that perhaps in a more conservative salon, customers might be freaked out by her tattoos. Her mother, however, is a different story. Her mother does not like tattoos. Ms. DeRosa says when her mom came to DC for a visit she had to wear long sleeves the entire time. Erin DeRosa belongs to a creative industry that accepts tattoos in the workplace. Fashion, graphic design and technology industries are also lax, or not strict, about workers having tattoos. But industries such as medical and financial are more traditional about workers’ appearance. These observations are from Natasha Olinger, a human resource, or hiring, specialist. Ms. Olinger has been an HR specialist in Washington, D.C. for the past decade. The stricter industries, explains Ms. Olinger, are mostly what she calls, “customer-facing.” People in medicine, law and finance must deal with the public face-to-face. If an employee represents a company, that company usually has a right to say how their employees should look. Many jobs in the technology industry are not customer-facing. They are back-end jobs and have little face-to-face time with customers. So, appearance is not as important. The tech industry is where a woman named Melissa Thomas has worked for the past 20 years. Ms. Thomas is a 47-year-old self-employed technology expert. She mainly works with the federal government supporting its software needs. Ms. Thomas got a small tattoo when she was in her 20s, even though her father opposed the idea. 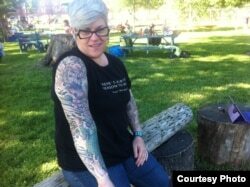 But when Ms. Thomas turned 40, she decided it was time to get the tattoos she has always wanted – a lot of them. Ms. Thomas explains she chose tattoo designs that are important to her in some way. She says she loves Japanese culture. 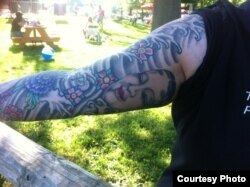 So, one of her arms has a full sleeve of brightly colored Japanese-looking tattoos. A bright blue fish swimming upstream shows determination, something in which she believes. 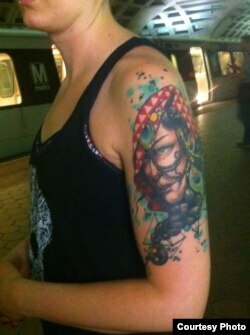 Melissa Thomas, IT specialist in Washington, D.C. and her Japanese theater mask tattoo. Ms. Thomas says she loves water. So, a waterfall flows down her arm. Washington, D.C. is known for cherry blossoms. So, she chose some cherry blossom tattoos to celebrate the city where her son was born. Her other arm is a work-in-progress. She says the tattoos are incomplete because her favorite artist started taking drugs again. She did not want drugs connected to her body art so she stopped going to him. This is actually one of the common opinions people have about tattoos – that the people who have them take drugs. Ms. Thomas was thoughtful, not only about the content, but also the location of her tattoos. She explains that she stopped the tattoos at her wrists so she can hide them, all of them, when she needs to or wants to. Speaking at a crowded private swimming pool near Washington, D.C., Ms. Thomas shows her tattoos proudly. Ms. Thomas is realistic about the effect her tattoos can have on others and on her career. The word she uses is “naïve,” or innocently unaware, to describe people with tattoos who think any work situation will accept their body art. Melissa Thomas picked her tattoos carefully. They all relate to something in her life. Can a tattoo cost you a job? In 2011, the career advice website, CareerBuilder.com, conducted a survey. They hired the company Harris Interactive to poll nearly 3,000 hiring managers across the U.S. These managers were asked to list the factors that kept them from promoting their employees. The top three were piercings, bad breath and visible tattoos. As HR expert Natasha Olinger points out, employers do not have to care about an employee’s right to express oneself through body art. In other words, no U.S. law restricts someone from getting a tattoo. But no U.S. law requires a business to hire a person with a tattoo, either. So yes, having a tattoo may cost you a job. Are employers becoming more tolerant? On the other hand, deciding not to hire people with tattoos may increasingly cost employers workers. Surveys show that more and more young people have tattoos – or, “ink.” In fact, according to the Pew Research Center, in the U.S. nearly four in ten Millennials, people aged 18 – 29, have at least one tattoo. Ms. Olinger says employers are finding that if they want to attract young talent they may have to become more tolerant of tattoos. Hiring people with tattoos may soon become an issue of staying relevant, or having a meaningful connection to the current way of doing things, says Ms. Olinger. There are some industries where tattoos have become the norm. It is difficult to find professional basketball players in the U.S. without tattoos. But in many other industries the appearance of the employee is important. Tattoos represent personal expression and individuality. This may not go along with the company’s image that the employees are to represent. One organization that is not becoming more lax with tattoos is the U.S. military. Soldiers getting tattoos is quite common. But in 2014, the U.S. Army angered many of its young soldiers when it banned tattoos below the knee and elbow. The new policy also affected some young people who sought to join the Army. The U.S. Army Recruiting Command told VOA that since April 1, 2014 more than 3,100 people have been disqualified from entering the Army because of their tattoos. On the other hand, in 2014 Starbucks announced that its employees could show their body art – to a point. Employees are still not allowed to have tattoos on the neck and face, according to the company’s guidelines. What do you think of tattoos in the workplace? Do you have a tattoo? Let us know in the comments section. Anna Matteo wrote this story for VOA Learning English, with additional reporting from Christopher Jones Cruise. Kelly Jean Kelly was the editor.